Moving further east of the Mississippi, we see a variety of airports I visited over the years, in addition to New York; (http://jonproctor.net/new-york-city-through-the-years/ ). Florida will follow in the next page. Some locales got just a few pictures while others received a little better exposure. Stand by, here we go! 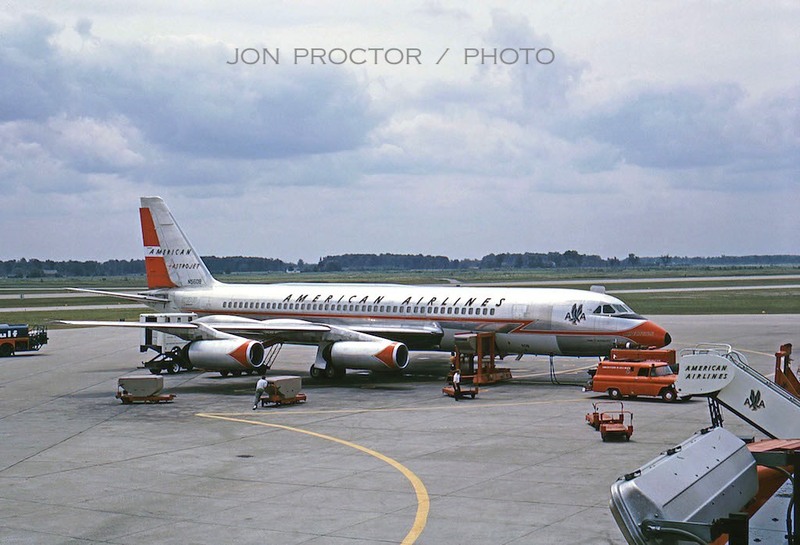 I visited Weir Cook Airport, Indianapolis for the first time on April 18, 1966, and only spent one night. The next morning, wet and humid, found me shooting a couple of pictures from the observation deck. 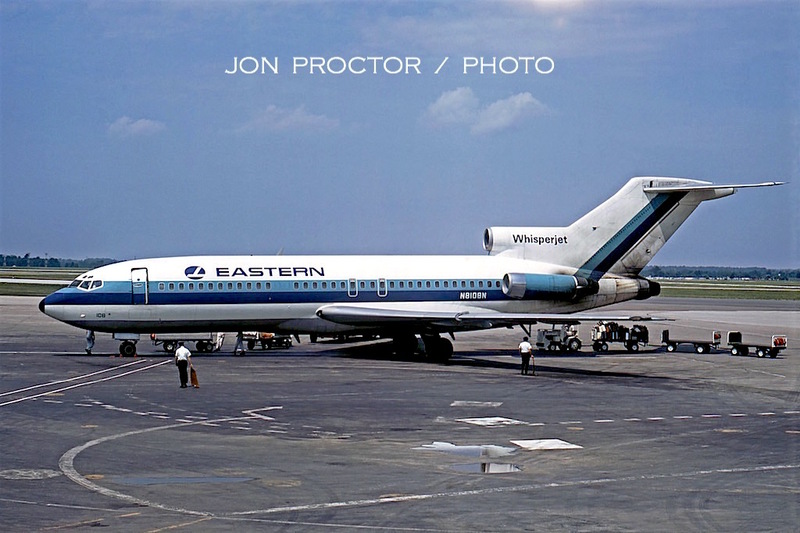 Eastern 188 Electra N5527 arrives early, with two engines already shut down for quick passenger disembarking and baggage unloading. Across the ramp, TWA 749A Constellation N6021C is ready to begin its working day as Flight 272 to Washington National Airport. I was a passenger on this, my one-and-only Connie flight. The triple-tailed fleet retired barely a year later. 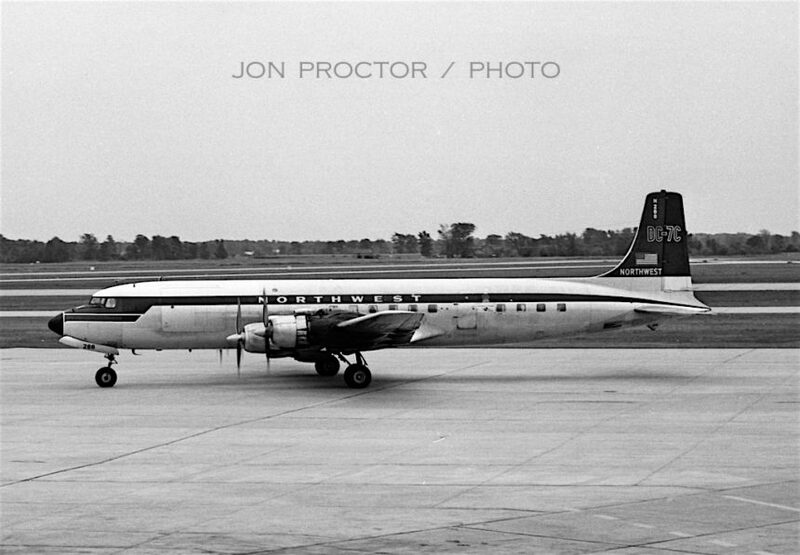 In June 1967, I again flew through Indy, with time to catch this image of Delta DC-6 N1904M. Backlighting made it a bit difficult to photograph. 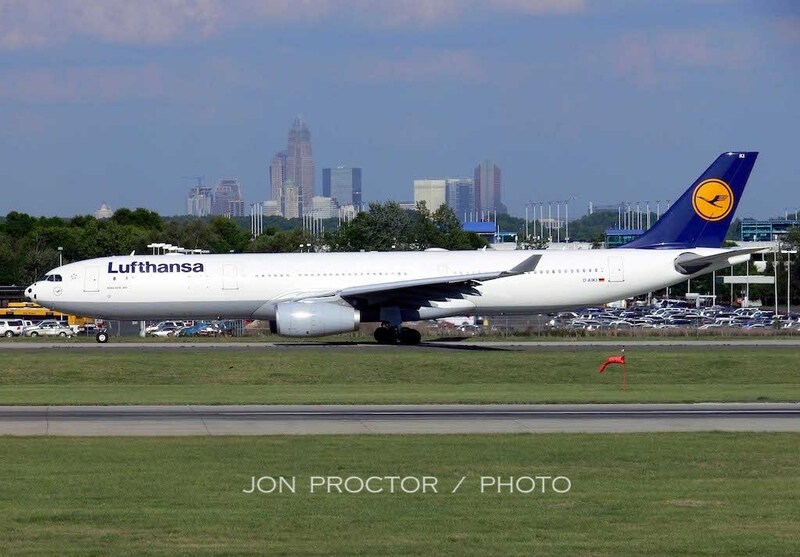 On the opposite ramp, lighting was nearly ideal for Eastern N8108N, seen moments after blocking into the gate. 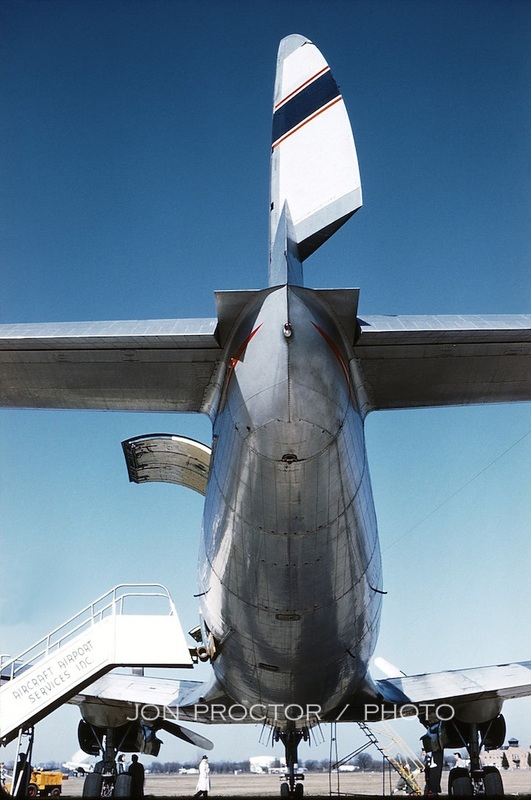 As ground agents head out to greet passengers disembarking from two exits, the forward door has been ‘cracked’ to allow extension of its integral staircase. 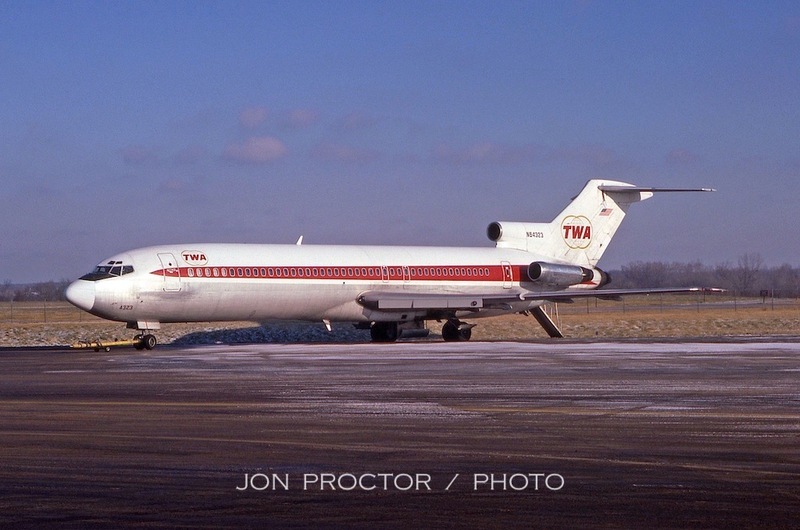 Fourteen years later, in April 1981, TWA 727-231 N54352 is framed by a sunny afternoon sky and striking cloud formation. 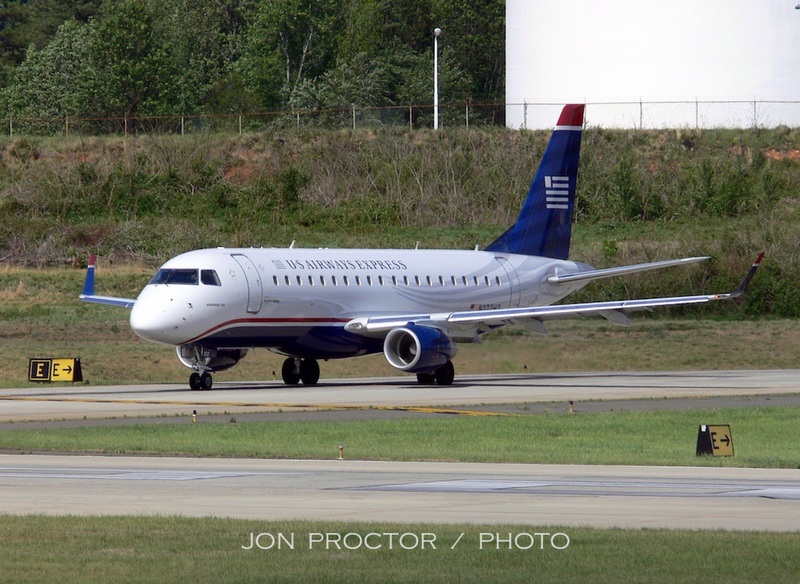 Moving on to Port Columbus (since renamed John Glenn Columbus International), I only caught a few images. 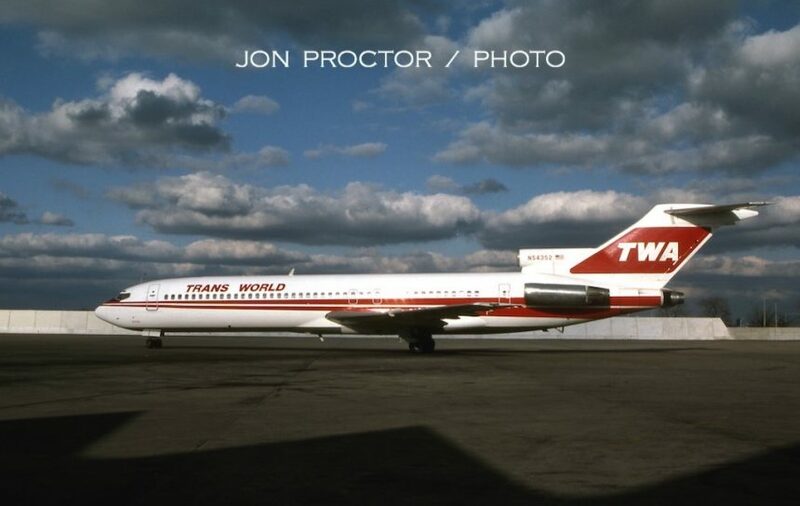 Above, TWA 727-231 N64323 still wears the globe-logo treatment in March 1979. Below, a month later and sitting in the same spot, sister ship N12306 has received updated the twin-stripes color, with hollow lettering. She needs a tail wash! 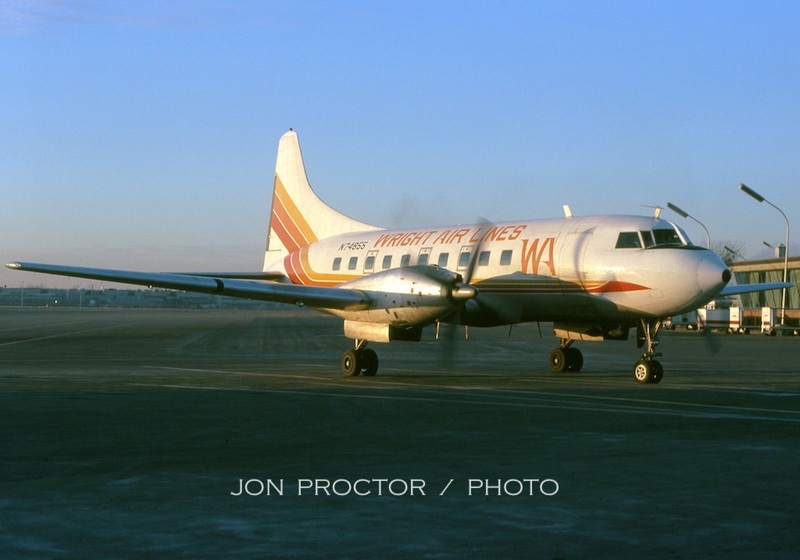 Based at Mansfield, Ohio, Fischer Brothers Aviation operated an Allegheny Commuter contract to Detroit, Cleveland, Mansfield and Galion with variety of small aircraft such as CASA 212s, SD330s and -360s, even de Havilland Doves. 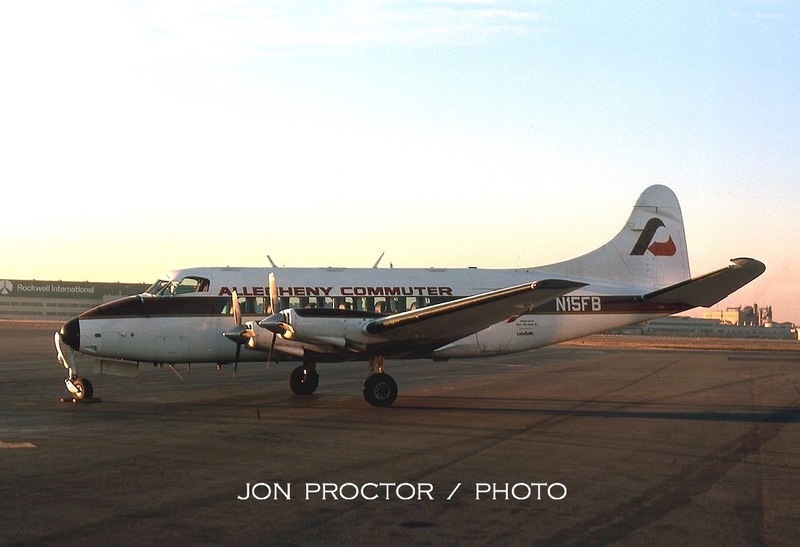 Here DH-114 Heron N15FB sits on a frigid January 1980 morning, awaiting the start of a busy day. 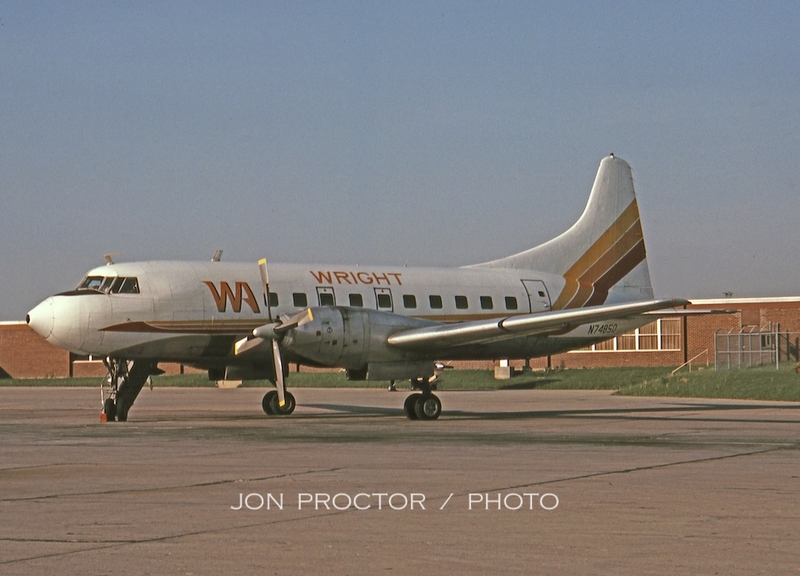 Cleveland-based Wright Airlines (FW, for “fly Wright!”) operated five Convair 600s, including flights from Columbus to Cleveland and Louisville. Above, I caught N74855 in January 1980. A Convair 240 delivered to American Airlines as N94225 in June 1948, it was sold to Central Airlines in 1962 and converted to turbine power four years later. 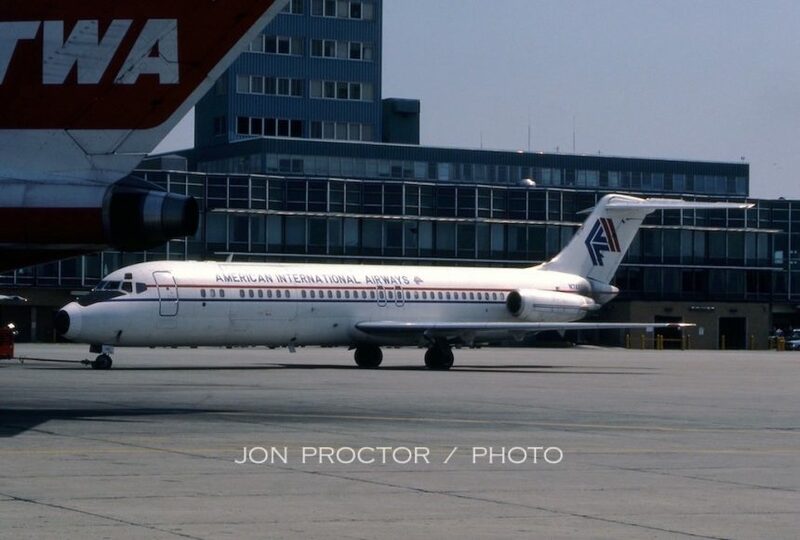 Another American Airlines original, as evidenced by the right-hand boarding door, N74850 started life as N94237, Flagship Akron and took a similar path to its sister ship. Its last known assignment was flying freight for SMB Stage Lines, from May 1985. 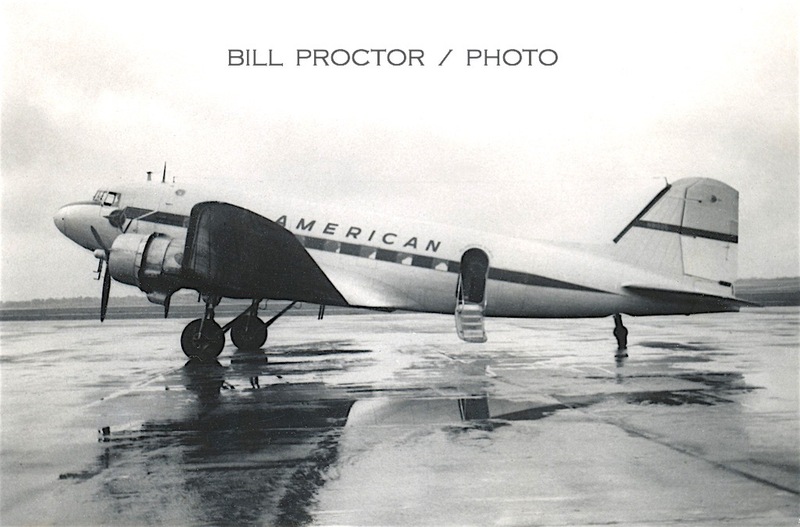 Brother Bill photographed All American Airways DC-3 N91225 on a wet ramp at Cincinnati (CVG) in September 1951, two years before the company was renamed Allegheny Airlines. 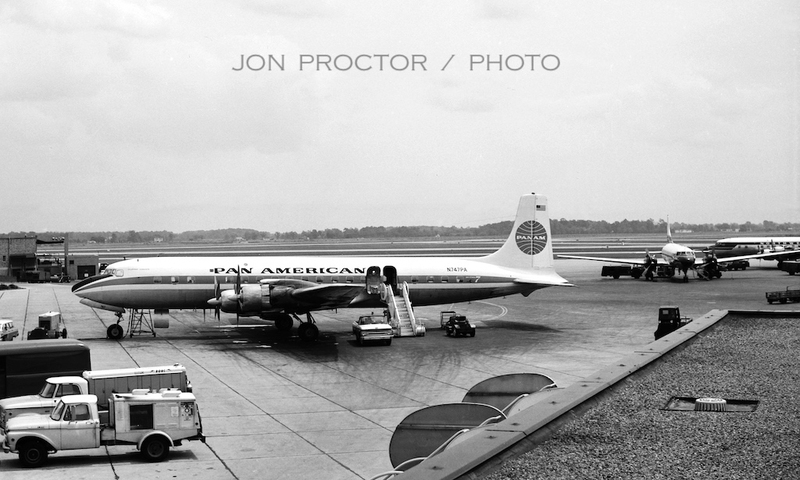 Somehow I missed shooting at CVG, except for this rather grainy image of American 188 Electra N6134A, photographed July 22, 1966, while I awaited another Electra to take me to Cleveland for a wedding. By now all references to the type had been removed. 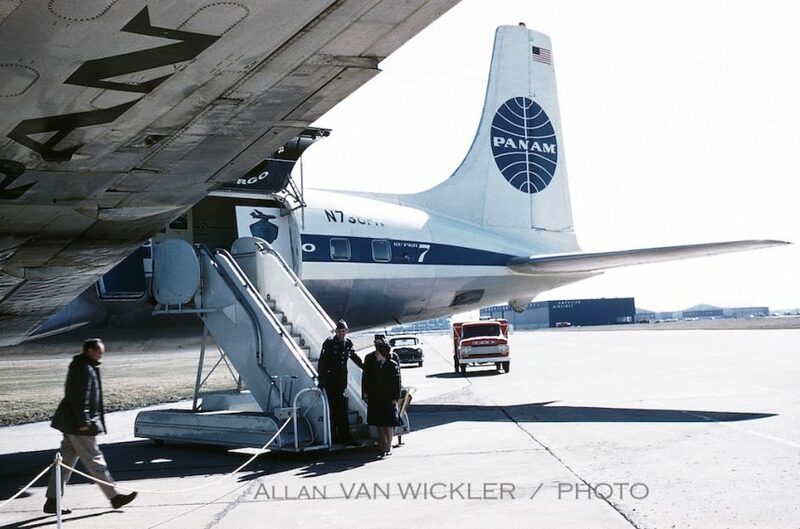 We start with a photography essay from the lens of my friend Allan Van Wickler, who was with Pan Am in Detroit. 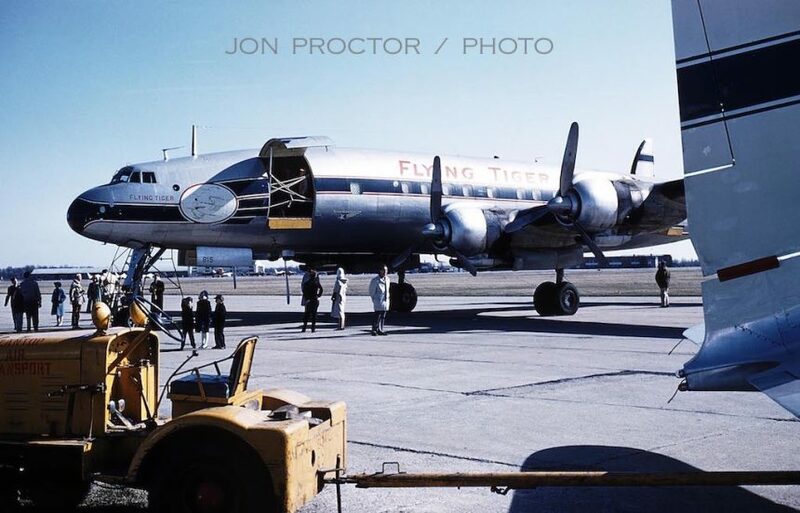 In April 1960, he worked a DTW open house, and caught these three images of DC-7C N736PA, which had recently been converted as a freight hauler. Island Airlines’ vintage Ford Tri-Motor was part of the static display. 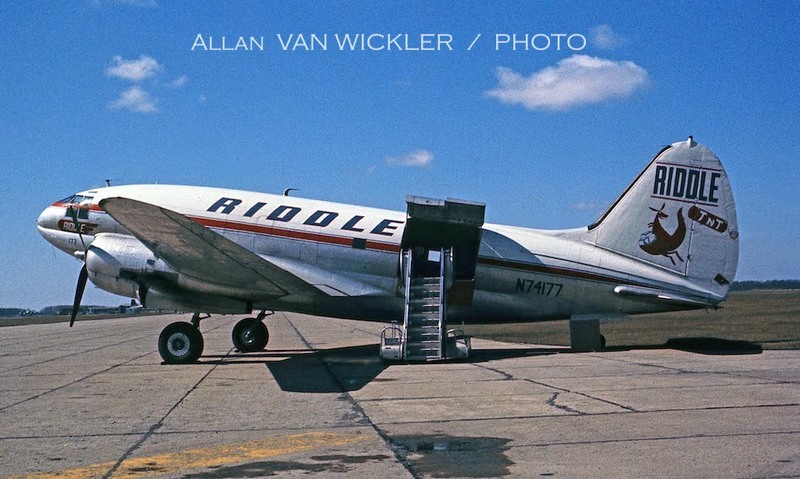 Also on display was military-surplus Riddle Airlines C-46 N74177. Earlier with Pan Am, it joined Riddle in 1955. 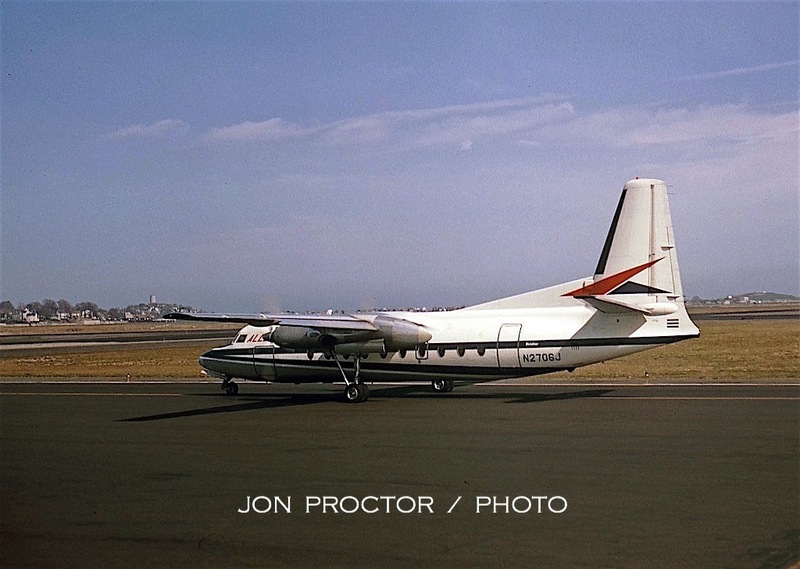 The operator became Airlift International in the mid-1960s and and hung onto the Commando until November 1971. Another view shows the unique “double-bubble” fuselage. Much larger than a DC-3, the Commando could carry considerably more cargo. It provided critical lift during the World War II Burma “Hump” operation. Still without radar, Flying Tigers 1049H Connie N6925C made an appearance. The type dominated FT’s fleet beginning in 1957. In addition to 15 purchased outright, eight more were acquired second-hand or on lease. 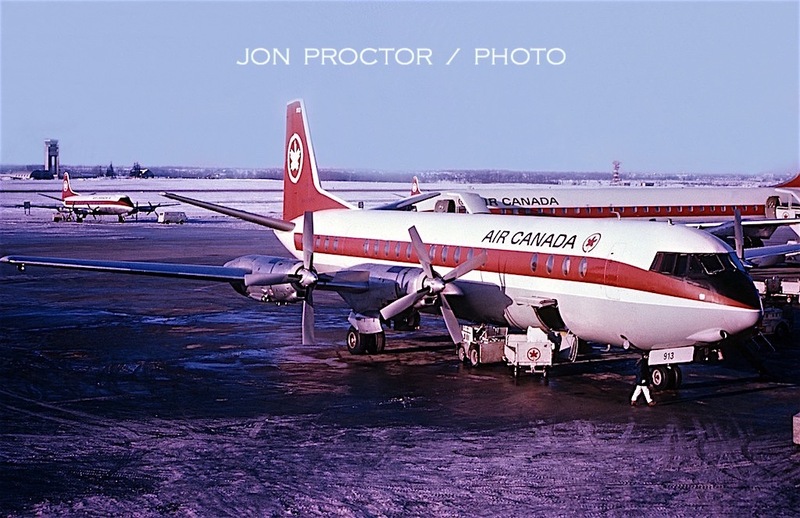 Canadair CL-44s began taking over in 1961. I first visited DTW on July 28, 1962, arriving from New York-Idlewild on American Flight 929, Convair 990 Astrojet N5608, seen as it was being readied for a return to the East Coast. It was my first 990 Astrojet ride; what a treat! No time was lost grabbing pictures from the generous observation deck. 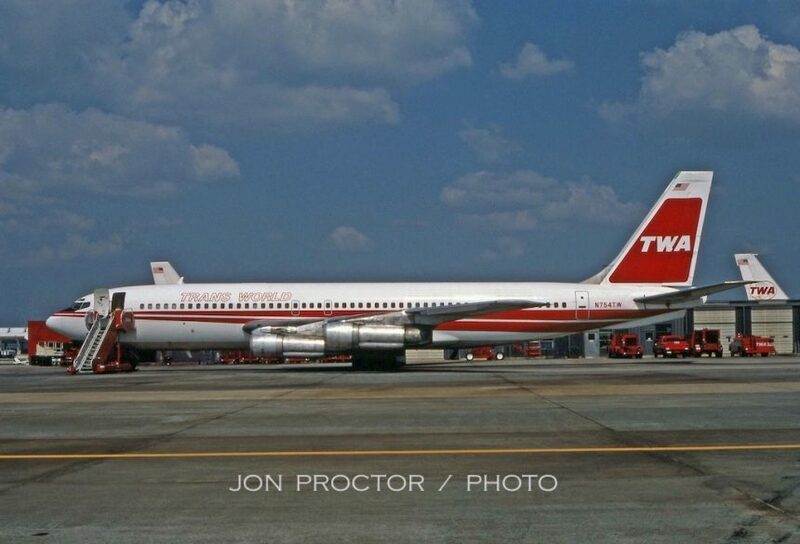 Here sits Allegheny Martin 202A N93204, a TWA original painted in AL’s updated and attractive livery . 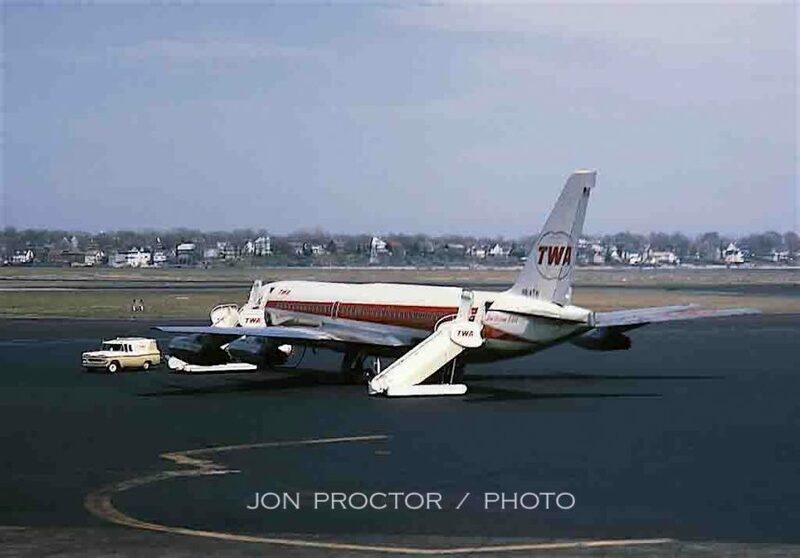 Thankfully this twin has been preserved at the Aviation Hall of Fame of New Jersey, in Teterboro, along with the forward fuselage of an ex-TWA Convair 880. A visit there would be well worthwhile. This is where I ran out of color slide film, but there’s still plenty to see. Northwest was a major player at DTW from early on. It operated no less than 37 Boeing 720-051Bs, including N723US, seen with a pair of company DC-6Bs off to the left. 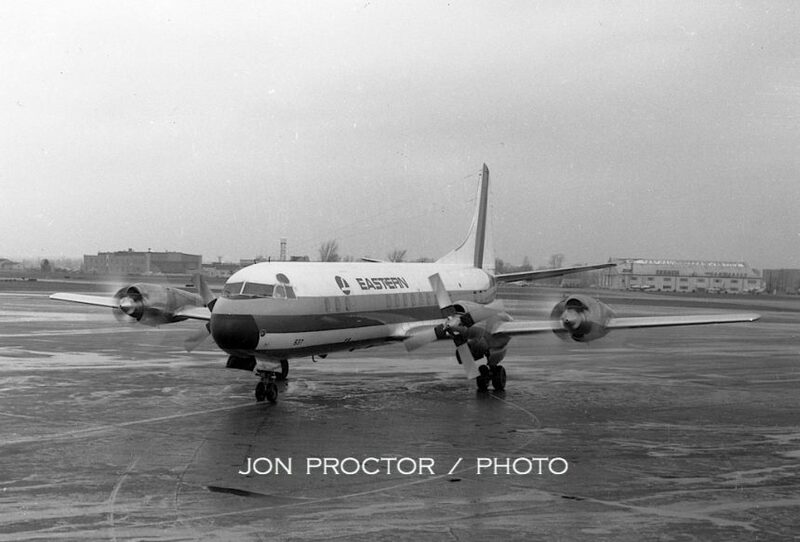 A relatively rare DC-7C, N288 was on of a handful Northwest had modified to perform ‘combi’ duties in a dual passenger-cargo role. Very few propliners were so converted. 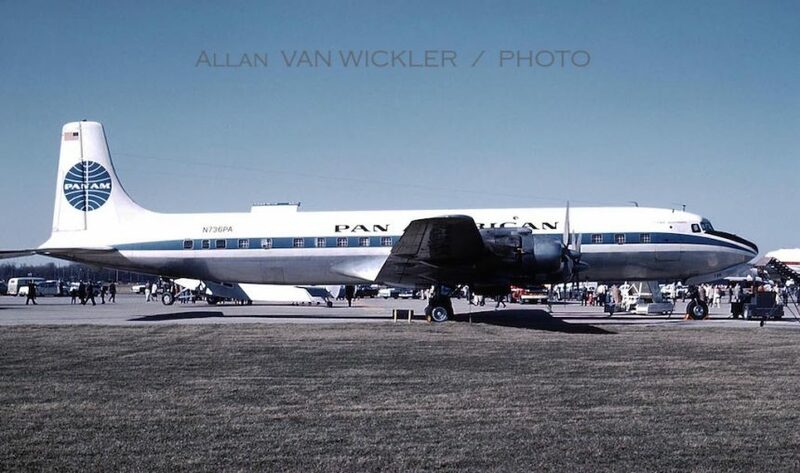 Still doing passenger trips, this Pan Am DC-7C, Clipper Ganges, carried N747PA, later to be worn on a company 747. 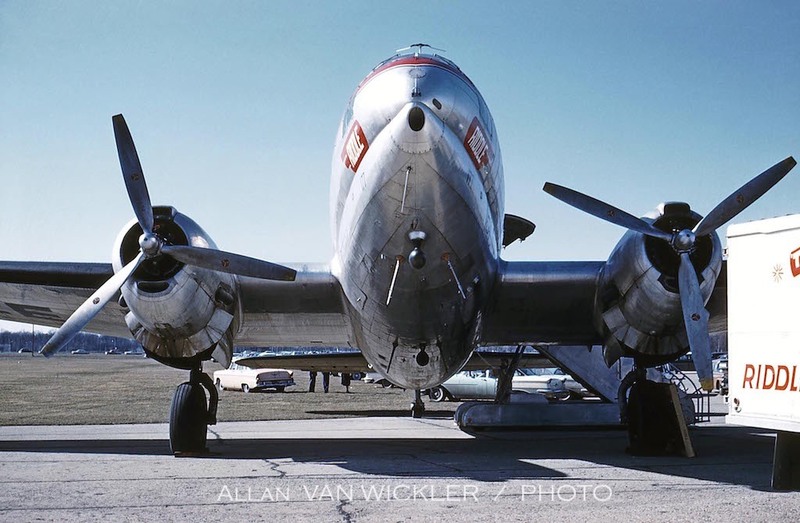 In fact, the entire PA DC-7C tail number inventory eventually migrated to jumbos. 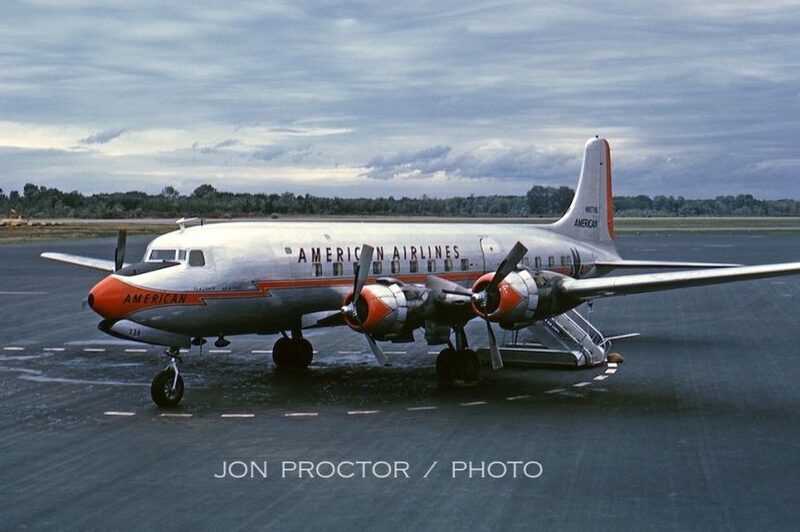 Here’s a series of pics depicting American Electra N6114A, Flagship Rochester, seen with Electra II titles on the tail and beside the doors. It soldiered on for another 25 years, with a few other owners, before being scrapped in 1987. 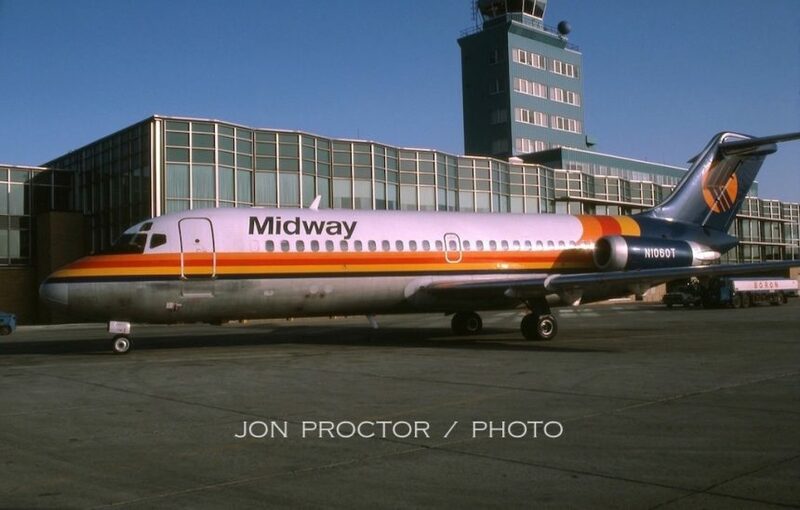 In December 1982 I caught Midway Airlines DC-9-15 N1060T at DTW, pulling into an adjacent gate. It was always good to see an ex-TWA airliner, even flying in competition with us on some routes. Pushed out of an adjacent gate, American International DC-9-33CF N7465B earlier flew for Balair, Intavia and Hawaiian Air, then ABX Air and Everts Air Cargo, where it still resides, hauling freight in Alaska. Just one stop at Harrisburgh. I worked a month of two-day 707 trips in October 1981, with MDT layovers; (perfect timing to watch the World Series!). TWA’s 707-131B fleet was dwindling at this point, including N6764T, so it was nice to log them one more time. The airport still lacked Jetways but boarding the old-fashioned way just added to the nostalgia. On to the Nation’s Capital. 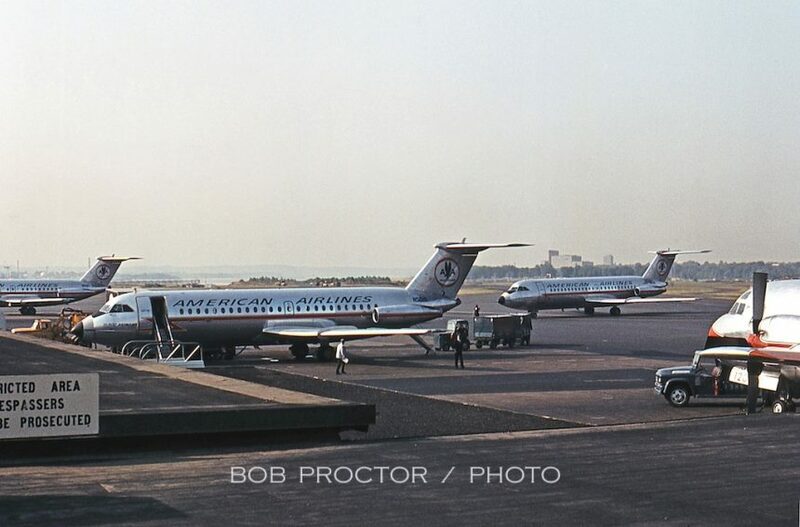 Brother Bob caught a gaggle of American BAC 1-11 Astrojets during a July 1966 visit. 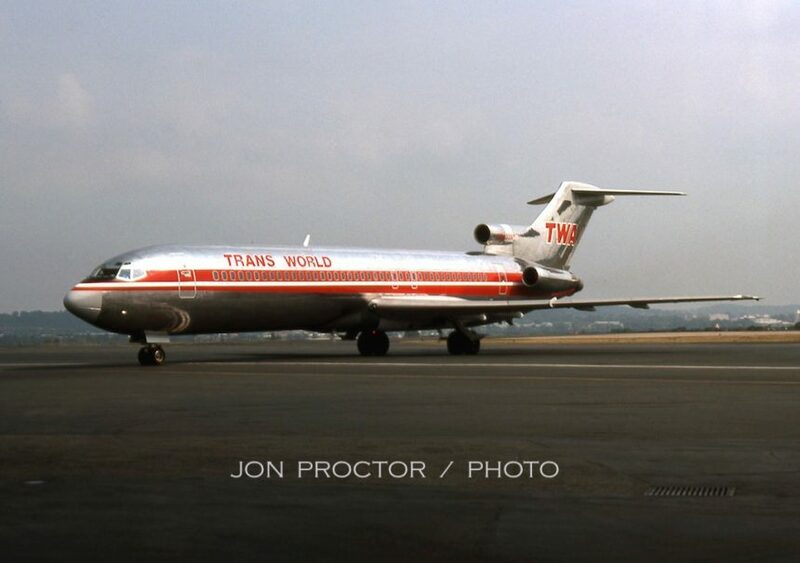 Behold the TWA Silver Bullet! This bare-metal treatment was applied in 1980 as a sort-of test to evaluate the weight reduction of paint versus maintenance cost of polishing. In the end, it was not considered worthwhile and N64339 reverted to its standard livery. But it turned out to be the only TWA 727 to wear four different color schemes, and operated the carrier’s final revenue ‘three-holer’ service, on September 30, 2000. 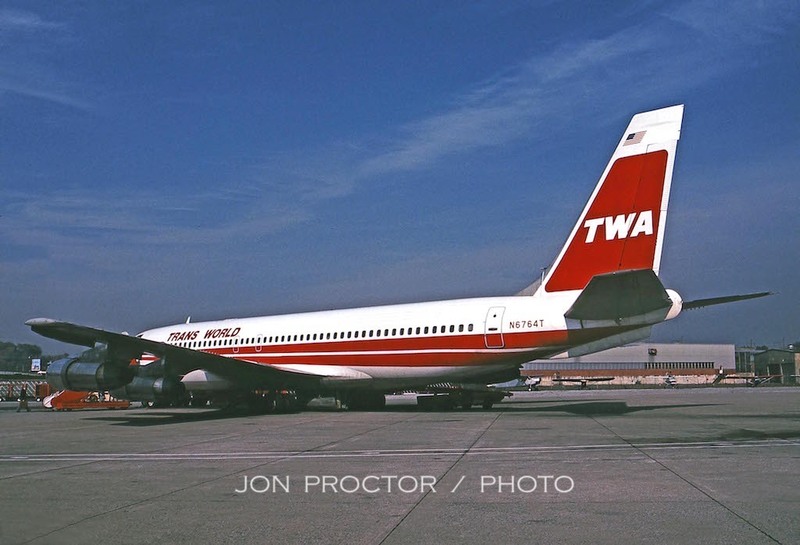 I spent a day at Dulles International on September 18, 1976, during a brief TWA mechanics strike. 707-131B N754TW was one of three Boeings parked there. 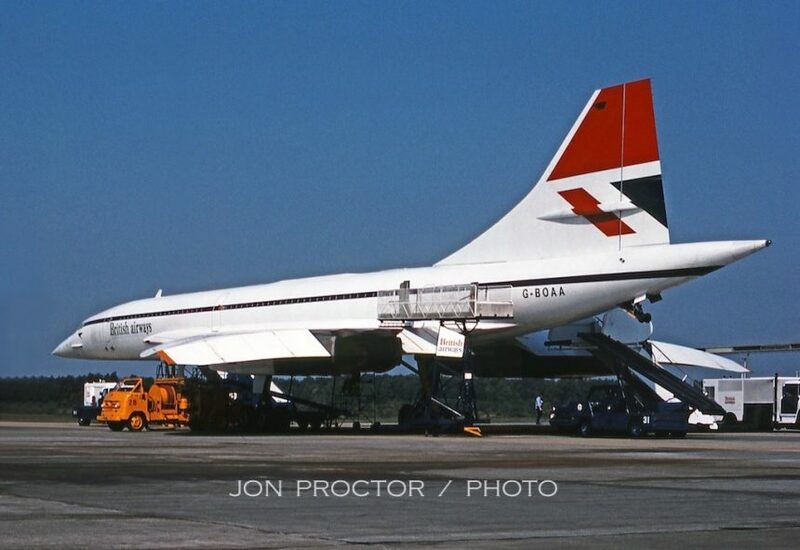 An unexpected treat was British Airways Concorde G-BOAA, having arrived earlier on its daily flight from London. This was before the type was allowed to land at New York. Cabin interior cleaning had been undertaken prior to locking up the airplane for its overnight stay. At the last minute a BA manager permitted a quick look-see. Little did I know at the time, that I would ride ‘Alpha-Alpha’ less than a year later, faster than a speeding bullet! 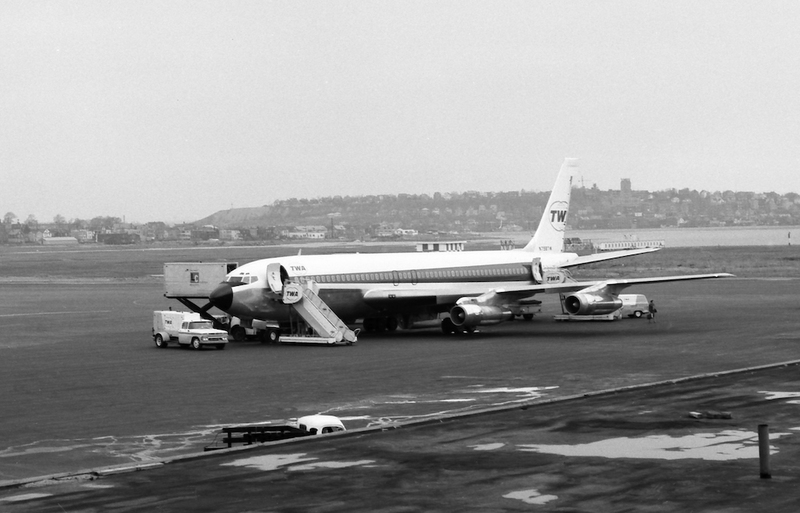 On April 21, 1966, I arrived at Boston-Logan on TWA Flight 86 from Baltimore aboard 707-131B N798TW, then hustled up to the observation deck to photograph her on an overcast day. Two days later the weather had cleared, providing some nice photography. 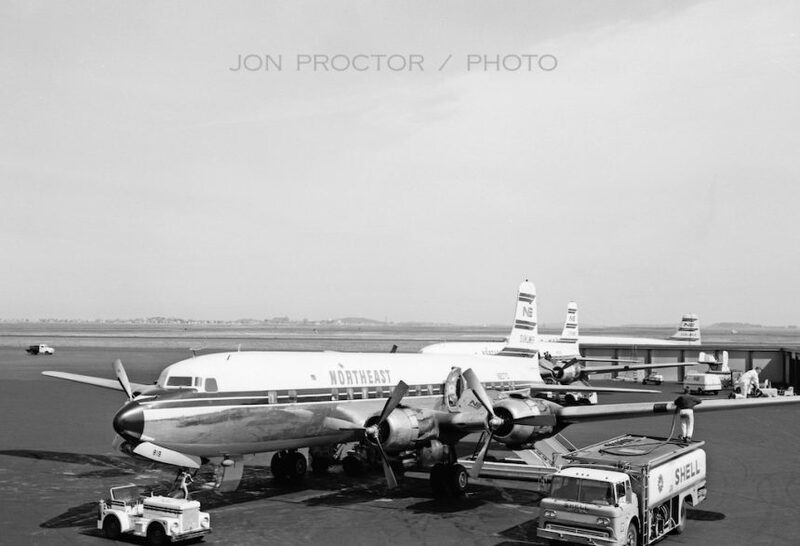 Three Northeast DC-6B Sunliners were lined up for my lens. In the foreground sits N6583C. 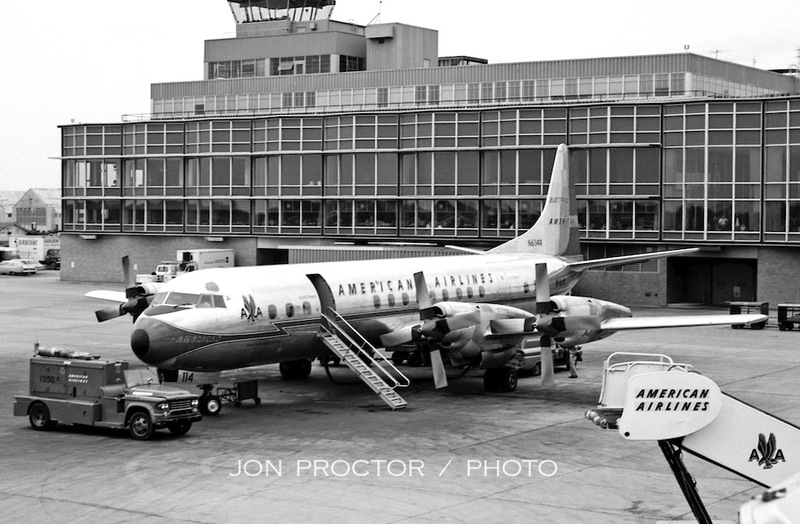 The same three airplanes, this time in black & white, include N90770, a former American Airlines Flagship. 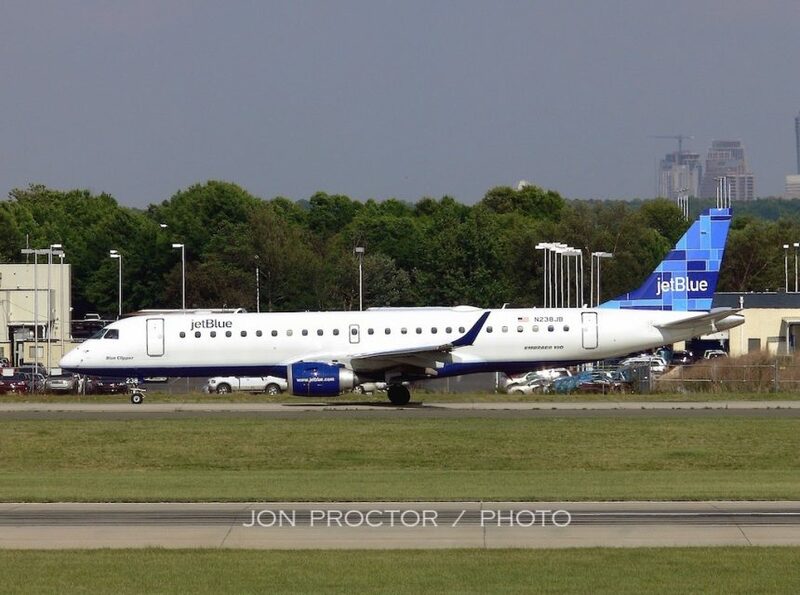 Look closely and you’ll notice the boarding steps wearing Yellowbird markings. None of the company Sixes or Viscounts were repainted. 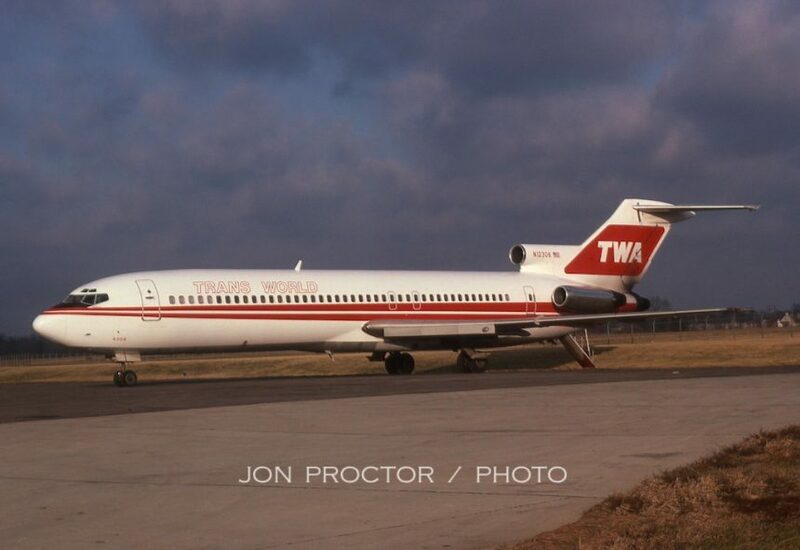 TWA 727-31 N859TW gets a drink of high-octane milk before its dispatch a Flight 407 to San Francisco, via New York-La Guardia, St Louis, Kansas City and Los Angeles. At the next gate, Convair 880 N814TW would take me to New York-JFK as Flight 125 before heading on to Cincinnati. 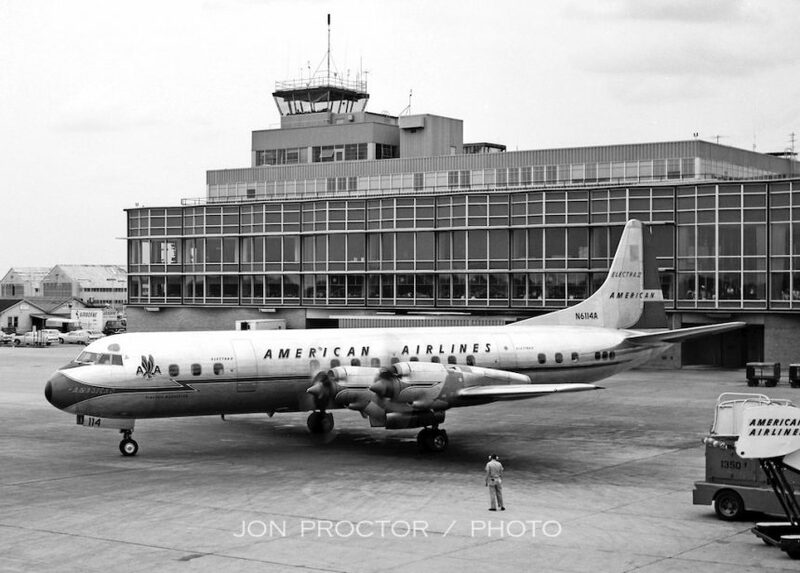 As my flight taxied awaited ATC backups at JFK, Allegheny F-27J Vistaliner N2706J moved ahead. 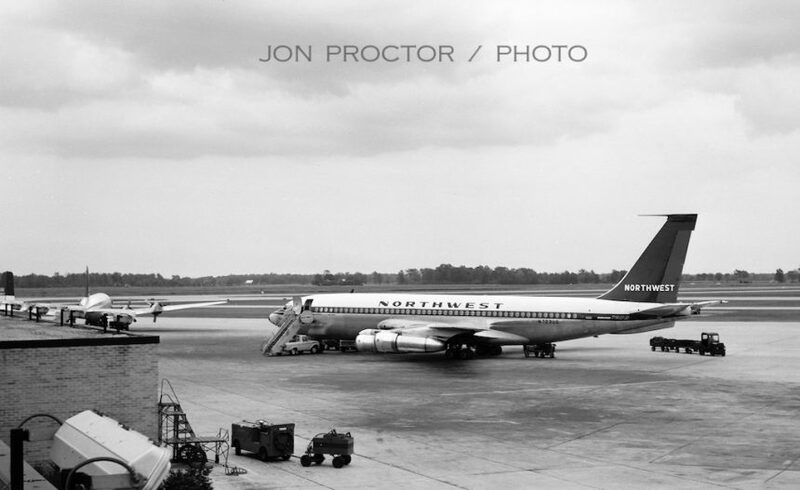 If the Sumer ’66 schedule is any indication, it was Flight 933, bound for Bridgeport, Islip and Washington-National. 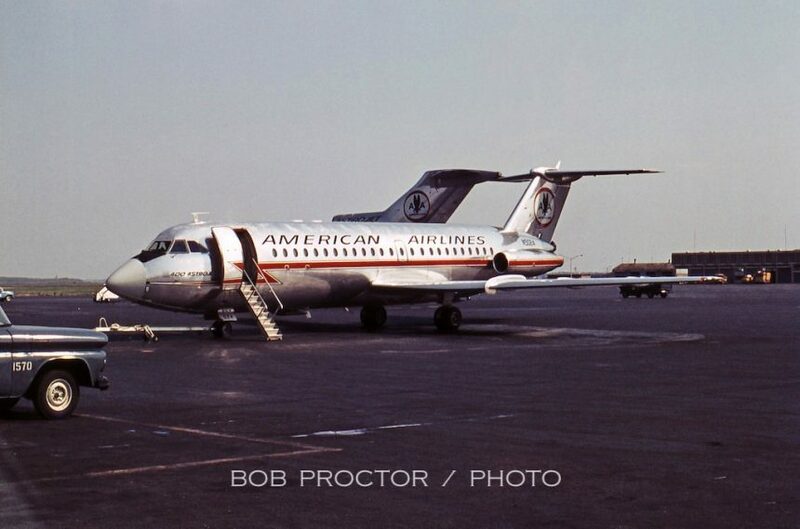 On June 2 1967 Brother Bob caught American BAC 1-11 Astrojet N5024. 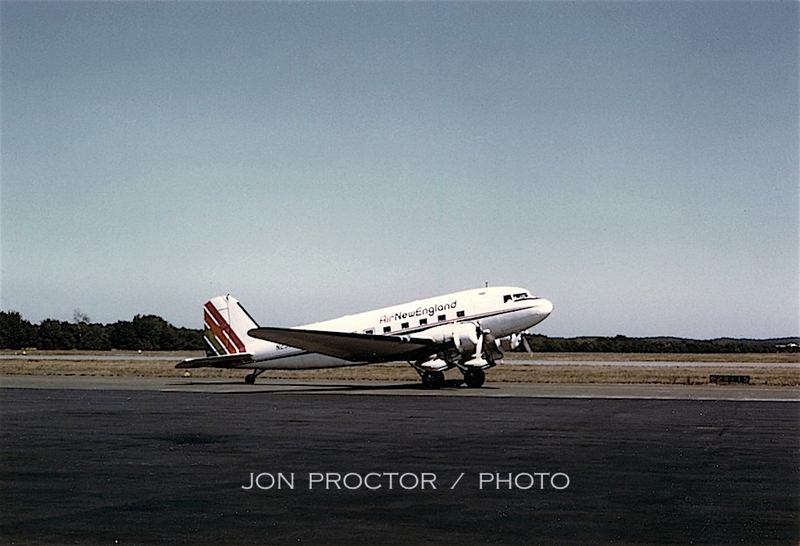 His logbook shows a different 1-11 took him to New York La Guardia the same day. 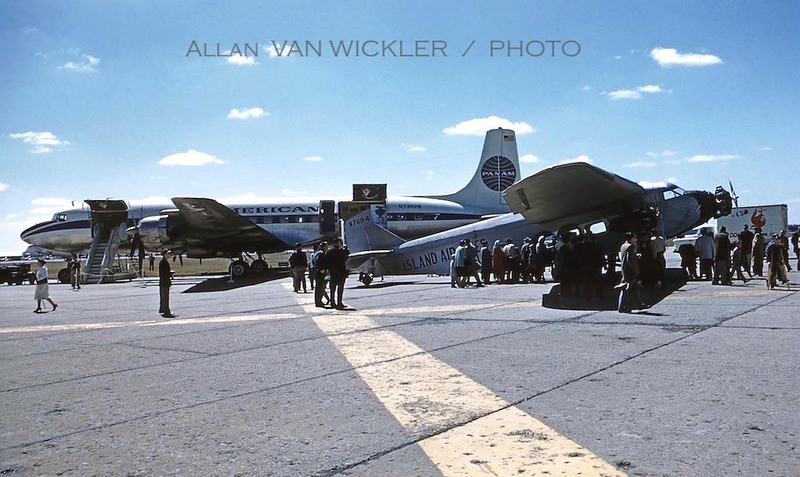 I visited my Uncle Jack and Aunt Frances Wood in Syracuse July 27-28, 1962, riding up from La Guardia on American DC-6 N90726, Flagship Memphis. On arrival I got a minute on the obs deck to snap this picture. The next morning AA DC-6 N90731, Flagship New Haven, took me back to New York. Seen here pilots board ahead of customers. Note the Eastern Air Lines boarding steps! 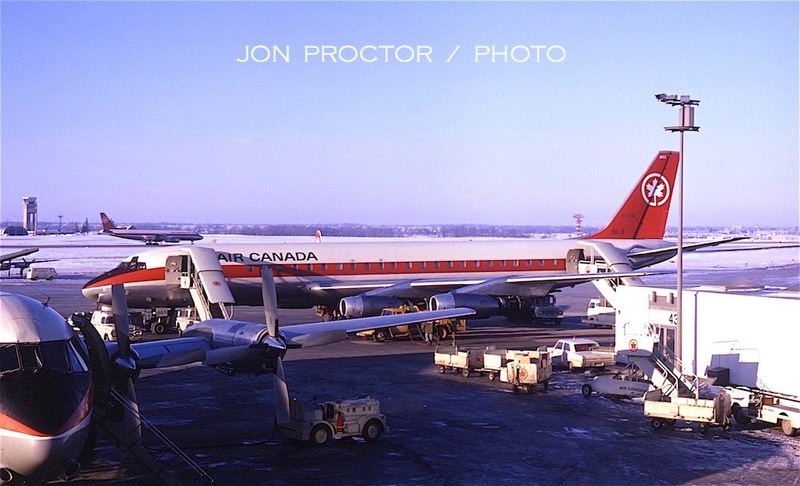 Another case of a brief Toronto stopover occurred on January 21, 1968. 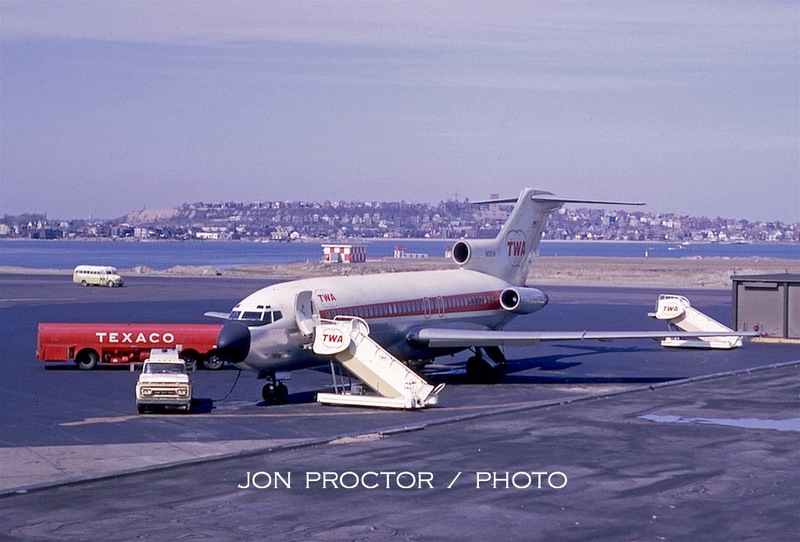 A TWA sales rep secured a pass for me, on Air Canada, roundtrip LAX-Montreal. On the way back I was obliged, with the rest of the through non-revs, to get off at YYZ and stand by for the onward segment, owing to a full flight. It gave me the chance to shoot AC Vanguard 952 CF-TKM, with company Viscounts and the DC-8 I rode sitting in the background. Heres a shot of Rolls-Royce powered DC-8-42 CF-TJC. Fortunately I got back on, scoring a first-class window seat. Air Canada’s renowned Connoisseur Service was absolutely spectacular, featuring a forward lounge with bar and bartender, plus an elegant meal service featuring fresh orange and grapefruit juice, cooked-to-oder entrees and a most attentive cabin staff; I was blown away. 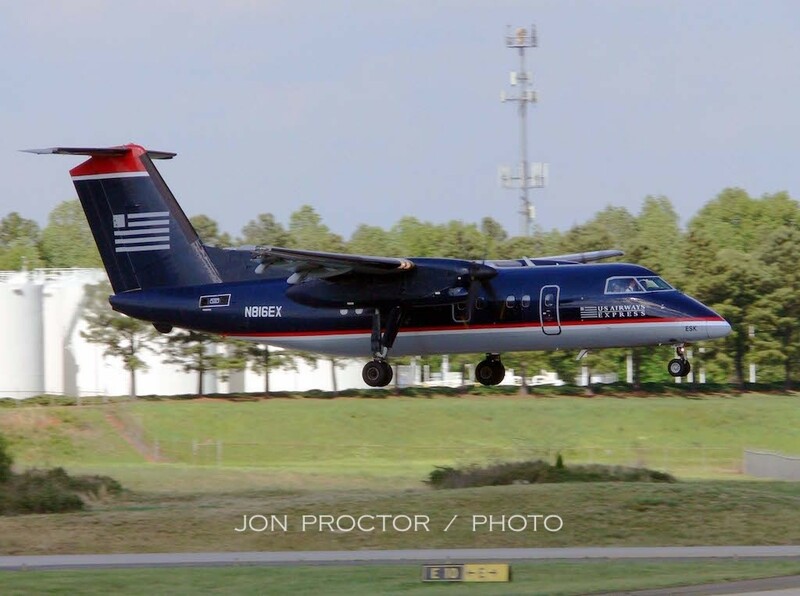 On to Atlanta-Hartsfield (ATL). While still living in LA I visited my brother and family in Winter Park, Florida, often riding Delta back and forth. 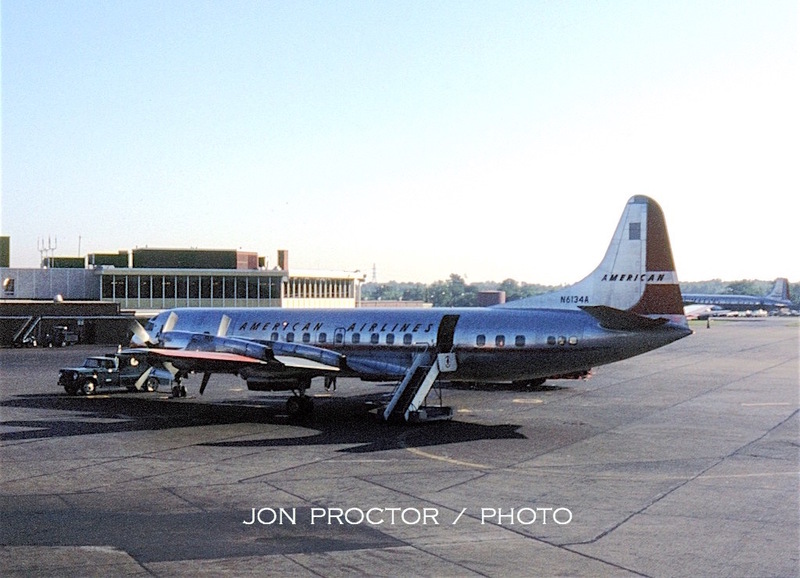 In the 1960s there was LAX-MCO service via DAL but most of my travel was via Hartsfield. An added benefit was photo ops, of course. 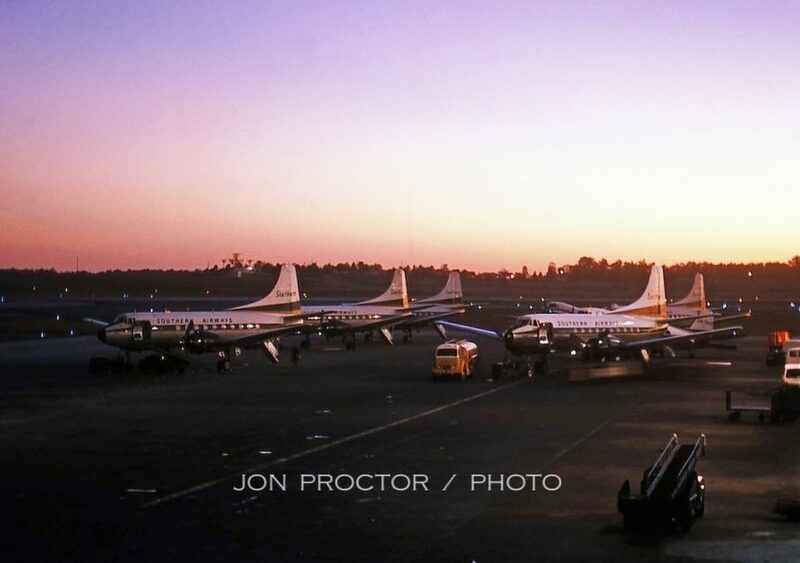 Above, Southern Martin 404s and a single DC-3 lined the ramp in this evening shot on November 1, 1965. 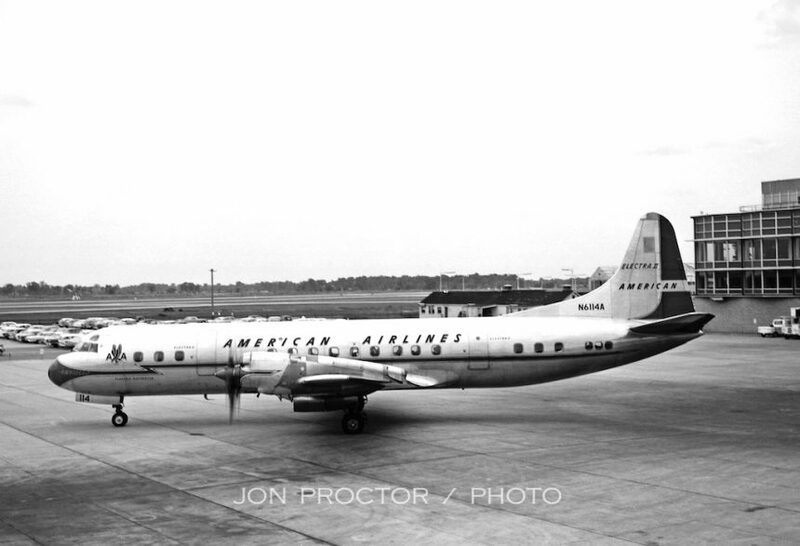 United Air Lines acquired Atlanta service with the Capital Airlines merger in 1961. 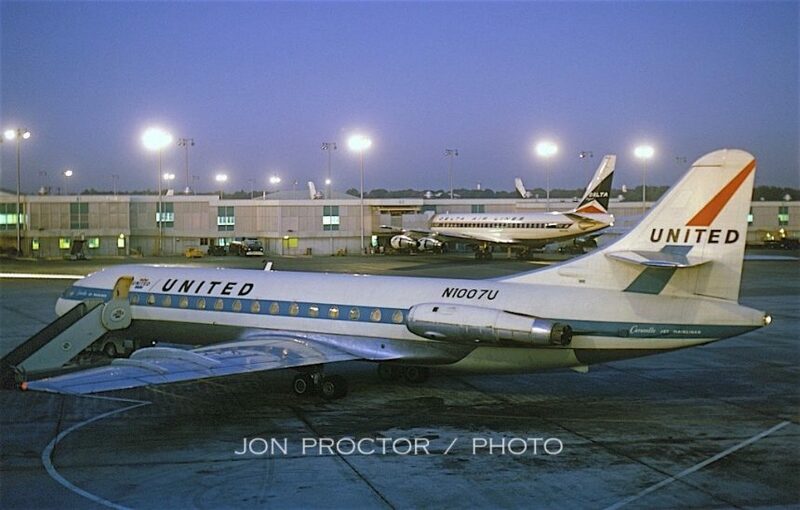 Sud Caravelle N1007U looks clean as a whistle in this shot. Sadly, individual names for the French twin had already disappeared. 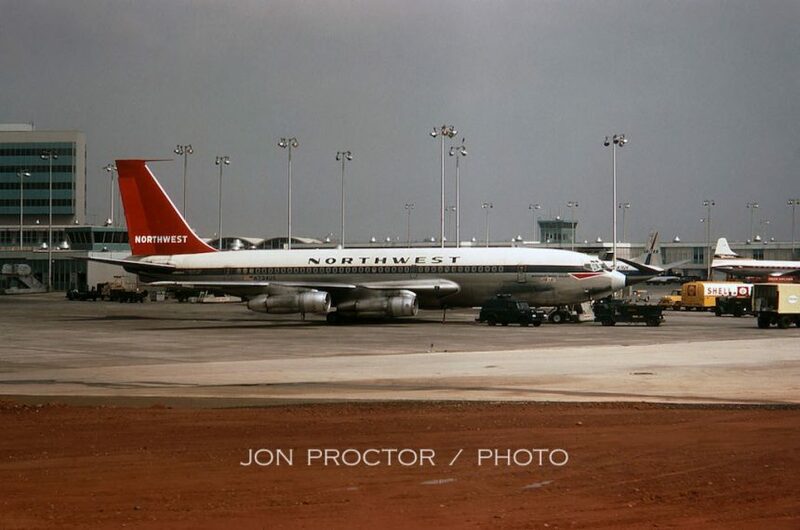 During March 29, 1967 stopover, I caught Northwest 720-051B N734US at the gate. 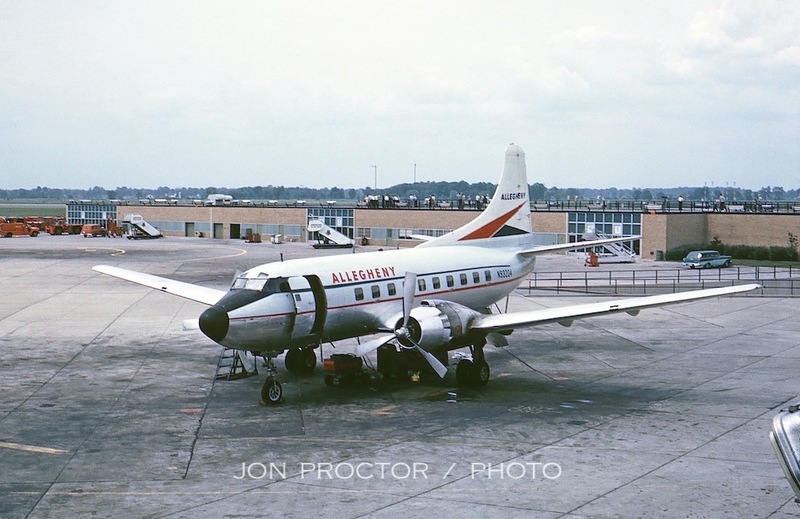 One of seven sold to Olympic Airways in 1972, it was registered SX-DBM and named Allakom River. 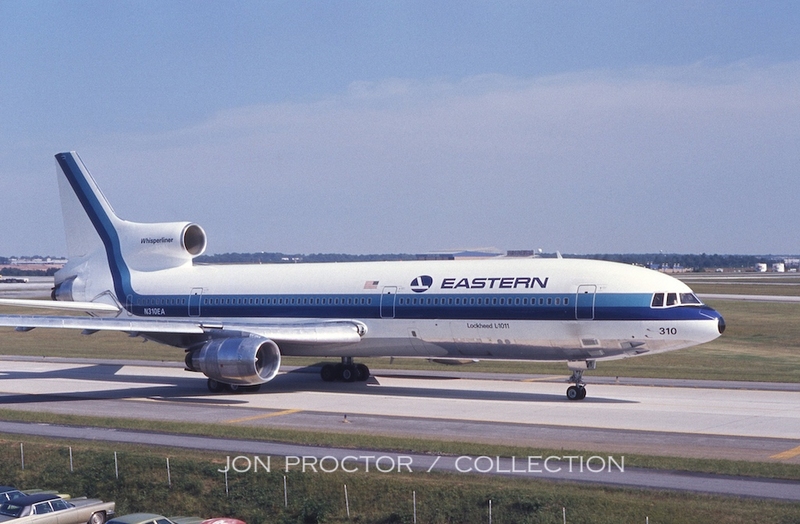 All were retired in 1980 and stored; five met the scrapper’s torch at Athens Airport. 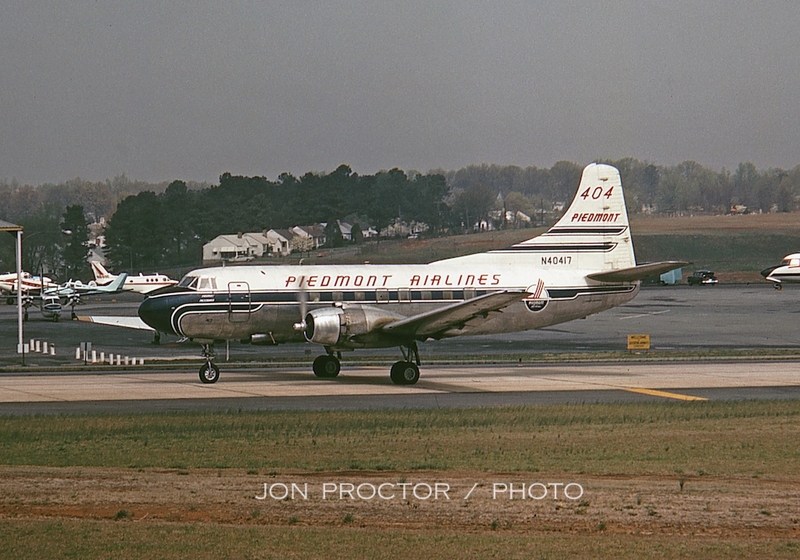 That same day I caught Martin 404 N40417, Piedmont Pacemaker taxiing on the ramp. The former TWA Skyliner Williamsport, it was part of a large Piedmont Martin fleet and retired only a year later. 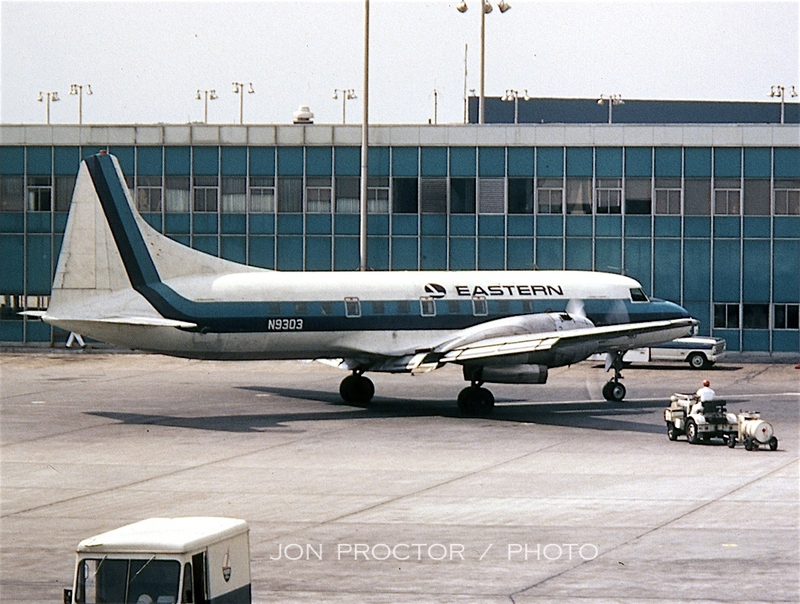 Eastern’s 50-strong Convair 440 fleet soldiered on many years after deliveries began in 1957. 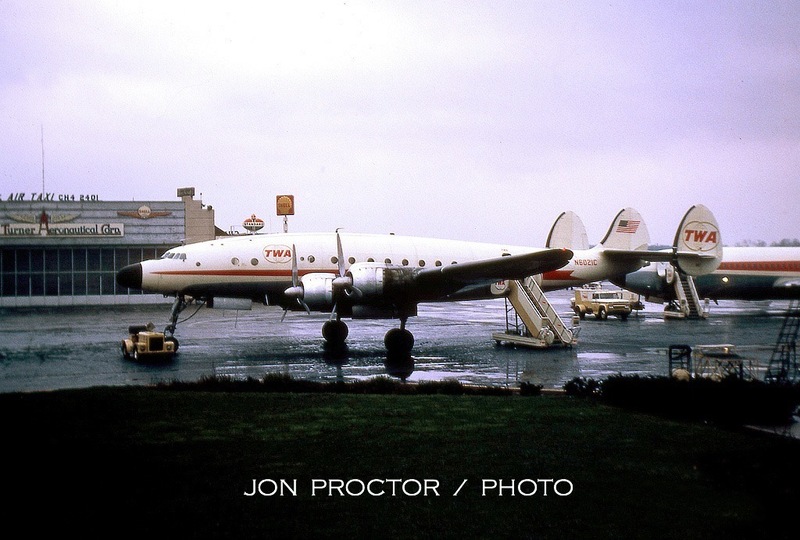 N9303 arrived in April 1957 and was withdrawn in March 1969, more than 18 months before the last twin was retired. 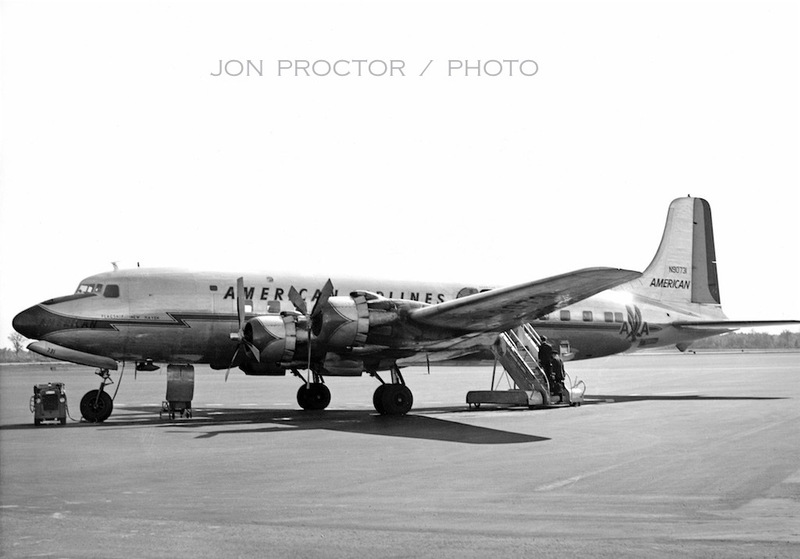 In contrast, EA’s Martin fleet, delivered five years ahead of the Convairs, was gone by the end of 1962. On December 11, 1967 I had barely enough time between flights for two images. Even two years after delivery Delta DC-9-14 N3305L still wears the original “sideways” logos and full Delta Air Lines titles. A company DC-8-51 reflects the shorter titles, while that Convair 880 hasn’t changed in seven years. 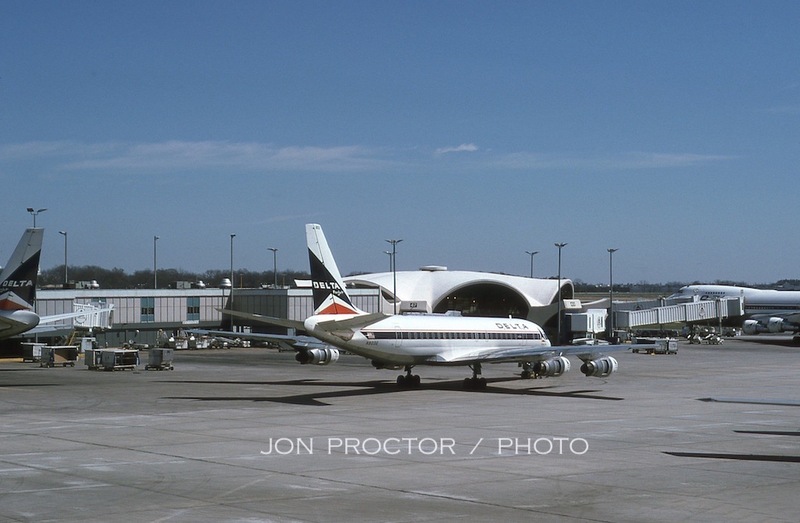 Piedmont leased 727-51C N7270C for a year from Boeing, while awaiting Boeing 737s. 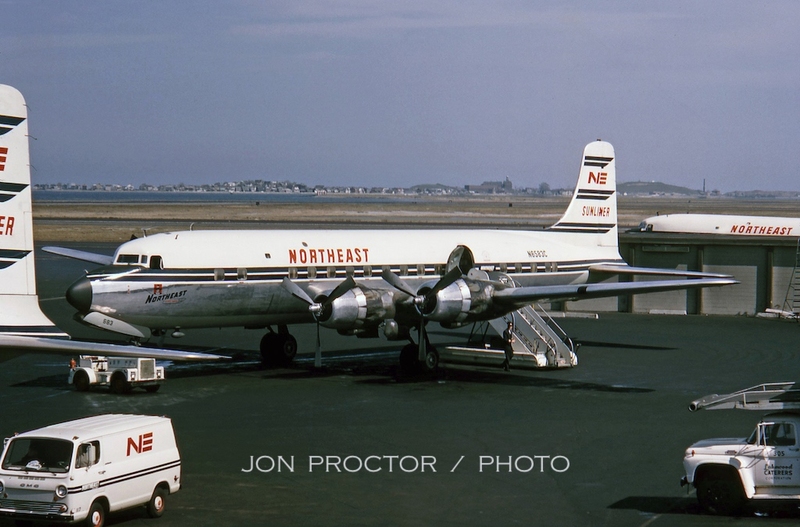 Built for Northwest but not taken up, Empire State Pacemaker later served with Braniff, Dominicana, Faucett and Kelowna Flightcraft. 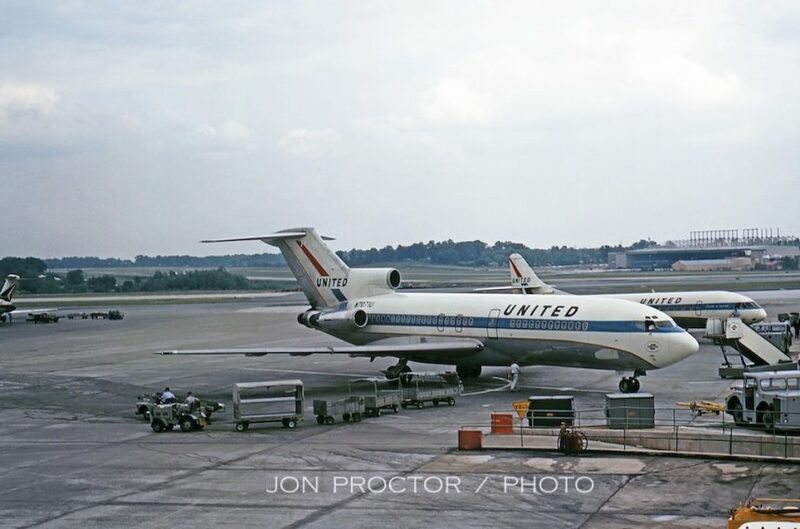 By May 1968 United was well-established at Hartsfield. 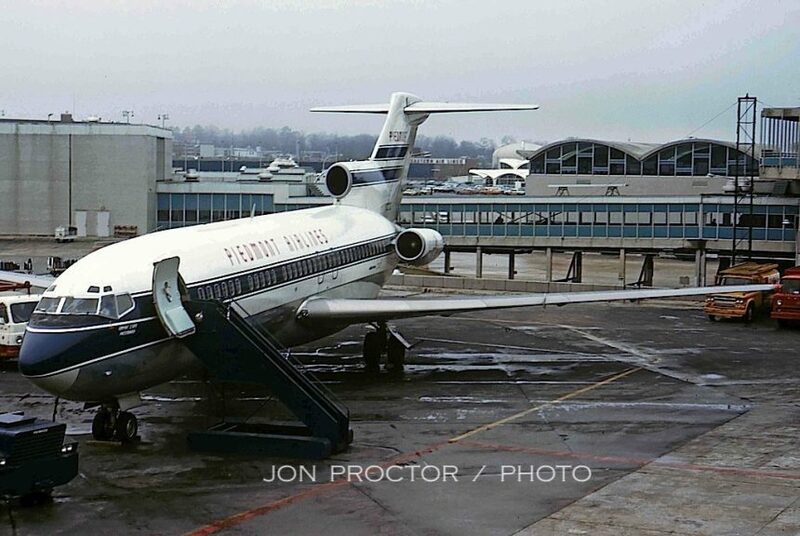 727-22 N7071U receives ground support with a company Caravelle sitting at an adjacent gate. I obtained this image some time back, I believe from Jerry Stanick, showing Eastern L-1011 N310EA sometime in 1972. Delivered in August that year, it crashed into the Florida Everglades four months later, on December 29. 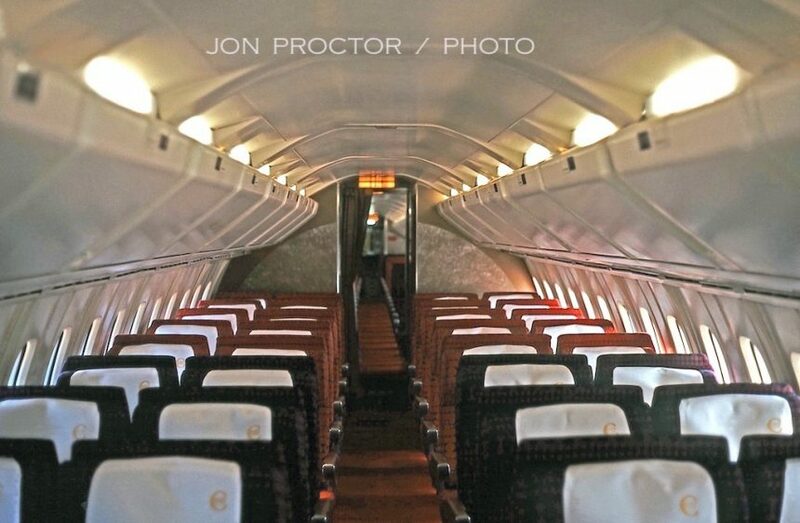 Discounting “The Ghost of Flight 401,” I recommend the book Crash, by Rob and Sarah Elder, available at amazon.com. 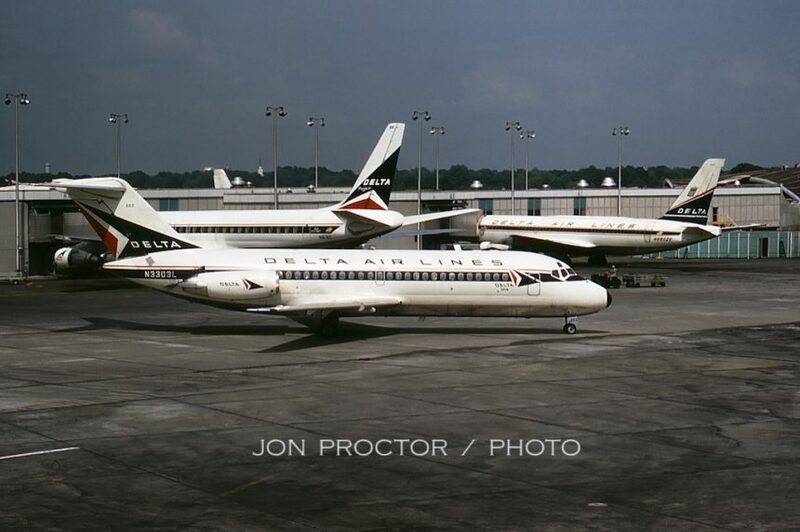 My last ATL picture was taken March 21, 1975, showing DC-8-51 N803E on pushback, with a company 747 partially visible to the right. I only spent one day shooting at Charlotte, April 7, 2007, taking advantage of a great viewing area open to the public. Without getting specific as to the types and airlines, here’s a sample of my efforts that day. COMING UP NEXT: Florida and the Caribbean – Stay tuned!